If you have missing or damaged teeth that need to be replaced, Dr. Stansbury can restore your beautiful, full smile using dental crown or bridge therapy. 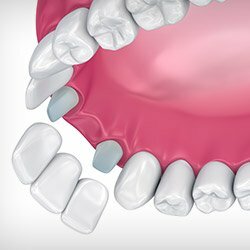 Our Tyler dental office uses these treatments to offer our patients customized, realistic-looking, and permanent alternatives to other restorative dentistry techniques. Contact us today to learn more or to schedule your appointment. Why Choose Stansbury Dental for Dental Crowns & Bridges? A dental crown caps over a damaged tooth, and it can return structure, strength, and function to a tooth with extensive decay or damage. Designed to fit snugly and function as a healthy tooth, this type of restoration will protect the dental structure from further damage and preserve your jaw's natural alignment. To maintain a fully white smile, Dr. Stansbury will recommend an all-ceramic crown. Our precise color-matching system allows us to find the right shade of porcelain to seamlessly blend with your natural tooth color. Porcelain crowns are also extremely durable and long-lasting, which is why Dr. Stansbury uses them to replenish the oral health of our patient in Tyler. A fixed bridge is a prosthetic set of teeth that attaches on one or both sides to teeth prepared with dental crowns. 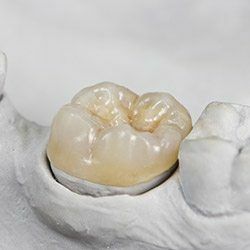 This restoration is permanently joined onto the neighboring abutment teeth (crowned teeth) and consists of three basic units: the prosthetic tooth or teeth and two abutment crowns. The style of fixed bridge that Dr. Stansbury suggests will depend upon the strength and health of your abutment teeth, as well as the location of your missing teeth. If healthy adjacent abutment teeth aren't available, a surgically-implanted metal post, known as a dental implant, can provide a solid alternative. For a bridge that replaces many teeth, Dr. Stansbury may recommend a removable partial denture or implant-supported prosthesis. If you've lost teeth due to an accident, injury, or gum disease, our Tyler dental team can create a permanent bridge to restore your solid smile. Bridges not only fill in gaps, but they also prevent the repositioning of the remaining teeth. They can also correct a misaligned bite, improve chewing function and speech articulation, and provide internal structure for the face to give you a more youthful appearance. Contact us today to schedule your appointment for crown or bridge therapy. Dr. Stansbury treats patients from Tyler, Kilgore, Flint, Lindale, and many nearby Texas towns. If this will be your first appointment at our office, take a moment to read the helpful information on our new patient page. Dr. Stansbury and our Tyler dental team are ready to complete your smile and bite with a custom dental restoration.